Richard Brinsley Sheridan "School for Scandal"
II. "A VOYAGE TO LILLIPUT"
III. "A VOYAGE TO BROBDINGNAG"
IV. "A VOYAGE TO LAPUTA, BALNIBARBI, LUGGNAGG"
V. "A VOYAGE TO THE COUNTRY OF THE HOUYHNHNMS"
Samuel Richardson "Pamela, or Virtue Rewarded"
Henry Fielding "The History of Tom Jones, a foundling"
William Hogarth, The Marriage Contract, from the Marriage a la Mode series, 1745, Tate Gallery, London. English novel of the 18th century. In matters of style, Italy was still the European leader. During the Renaissance, earnest efforts were made to reproduce the theatres of Classical times, which eventually led to the adoption of the proscenium arch and the proliferation of scenery and 'special effects', features that were adopted throughout Europe in the course of the 17th century. The first professional actors were those of the commedia dell'arte, popular comedies based on a traditional plot with the actors wearing masks and employing much improvisation, also deriving ultimately from Classical theatre. 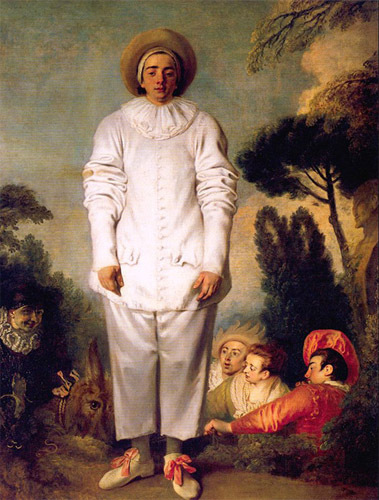 The traditional characters, Harlequin, Pulcinella, Pantaloon, etc., developed only gradually into fixed stereotypes. These companies seem to have included female performers from an early date. Because they travelled widely outside Italy, they influenced other countries and were probably responsible for the admission of women to the acting profession much earlier in France and Spain than in England, where the commedia dell'arte did not venture. The 'sentimental comedy' of the 18th century was hardly an improvement, and can now be seen as a kind of dress rehearsal for Victorian melodrama. Richard Brinsley Sheridan (1751-1816), born into a theatrical family in Dublin, restored the edge to English comedy by reviving the 'comedy of manners', which in his hands achieved new heights. His first play was The Rivals (1775), set in the fashionable spa town of Bath. It was a shambles on the first night but, after hasty rewriting, became very popular. The character Mrs Malaprop has given a new word to the language, malapropism. As she says, 'Sir, if I reprehend (comprehend) anything in this world, it is the use of my oracular (vernacular) tongue, and a nice derangement (arrangement) of epitaphs (epithets)'. 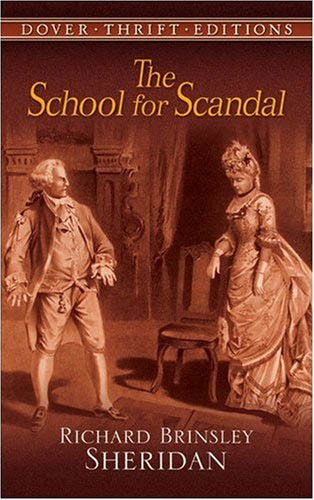 Even better is "School for Scandal"(1777), the best play of the century, ingeniously plotted, extremely funny and frequently revived. Like The Critic, Sheridan's third great comedy, it was written for the Drury Lane Theatre in which he had an interest. The revocation of the Edict of Nantes (removing toleration of the Huguenots) in 1685 is often taken as a convenient marker for the changing literary era in France. Cervantes and other satirists notwithstanding, Romance was not yet dead. Madeleine de Scudéry was still alive, and though her improbable tales of love and war set in antiquity had mostly been written in the 1650s, they remained popular. However, the romance was transformed by the Marie-Madeleine, comtesse de La Fayette, in particular by her La Princesse de Cleves (1678), with its sympathetic study of character. (It was a good time for women in literature, though as writers they still used synonyms, and the wonderful Letters of Mme de Sevigne were not published until 1725, nearly thirty years after her death.) 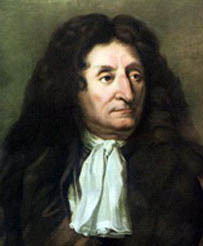 Another important influence was Jean de La Fontaine, whose verse "Fables" ('The Grasshopper and the Ant' etc. ), drawn from a wide variety of sources, were published between 1668 and 1694. Paul Scarron, first husband of the future Mme de Maintenon - Louis XIV's mistress and (secret) wife — was the author of the two-part Le Roman Comique, the Comic Novel (1651 and 1657), the story of a theatrical company in Le Mans which gives a lively account of provincial life. However, as far as the novel is concerned, the 17th-century heritage is not especially impressive, yet by the end of the century the novel was set to become a major genre. 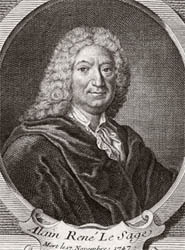 Alain-René Lesage (1668—1747) was a prolific author, said to have been the first French writer to live exclusively by the pen who, often with others, wrote about 100 popular comedies for the fairground stages of Paris. Many were based on Spanish originals. His Le Diable Boiteux (1707) is an imaginative, picaresque-satirical tale, but of interest chiefly as a rehearsal for his masterpiece, The Adventures of Gil Bias Santillana, which was published in instalments between 1715 and 1735. One of the most successful novels in French literary history, it was, along with Rabelais, probably the single greatest French influence on the English comic novels of Fielding and Smollett (who translated it into English). Again, the Spanish influence is strong; in fact Lesage was accused of plagiarism. The form is broadly picaresque — the adventures of Gil Bias as he travels across Spain, with extraneous tales inserted here and there, written in a lively, earthy style, with a sharp but relatively benign eye for human idiosyncrasies and presenting a detailed panorama of contemporary life and manners. "Manon Lescaut" (1731) represents a big step forward. It was the last of a scries of novels by the Abbé (Antoine Francois) Prévost (1697— 1763), whose work as a translator of Richardson did much to popularize English literature in France. The Histoire du Chevalier des Grieux et de Manon Lescaut, its original title, tells of the love of the young aristocrat, des Grieux, torn disastrously between his conscience and his - stronger — passion for the beautiful but treacherous courtesan, Manon Lescaut. It was enormously successful, and later inspired operas by Alassenet and Puccini. "Manon Lescaut" appeared in the same year as the first part of Marianne, a novel by Pierre Marivaux, best known as a playwright, who gave the French language the term marivaudage, light-hearted banter. An important minor form of the early novel, written in the form of letters or a diary, dates from the 17th century, an early example being the French Letters from a Portuguese Nun. The chief proponent of the form in England was Samuel Richardson, whose work, translated by the Abbé Prévost, was an influence on Jean Jacques Rousseau's Julie, ou La Nouvelle Heloise (1761), in which the love story is mingled with a survey of contemporary ideas and customs. It was so popular when first published that libraries used to charge readers by the hour. The novel as memoir, which also originated in 17th-century France, took the form of autobiography, though in fact fictional. Early examples are on the whole less interesting than genuine memoirs of the time, of which there were many, the Memoires of the Due dc Saint-Simon, which cover the last years of the court of Louis XIV, being the best-known. One reason for the comparatively late development of the novel as a literary genre was that relatively few people could read. Literature was written for a comparatively small elite, and everyday stories of country folk were not in great demand. 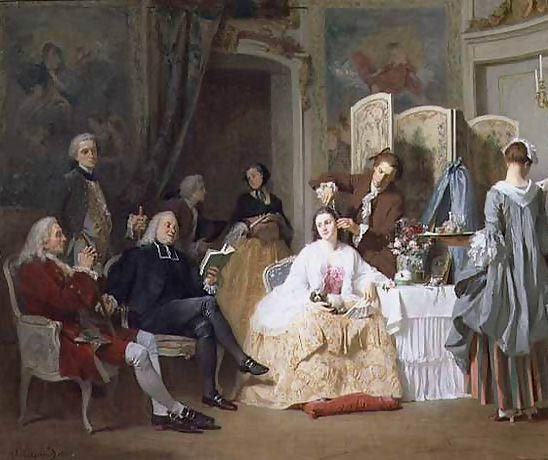 In 18th-century England, however, most males (fewer females) of the middle and upper classes, together with perhaps half the male working classes, could read. Production, as usual, expanded to satisfy the market. In spite of promising beginnings in the Elizabethan era, realistic English narrative fiction made slow progress in the 17th century, partly no doubt because political turmoil turned writers in other directions. Bunyan emerged as the first proletarian writer, though his literary method was practically medieval, and it was not until the turn of the century that the real beginnings of the English novel appeared. Daniel Defoe (1660-1731) was himself something of a picaro, who served spells in prison, even the pillory, and was not noted for his high principles either in life or literature. 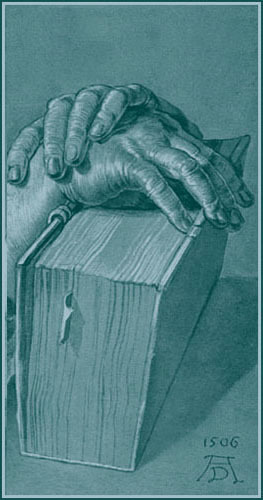 He was a prodigious writer, and a complete bibliography of his works poses a formidable challenge to the most assiduous researcher armed with the heftiest computer. 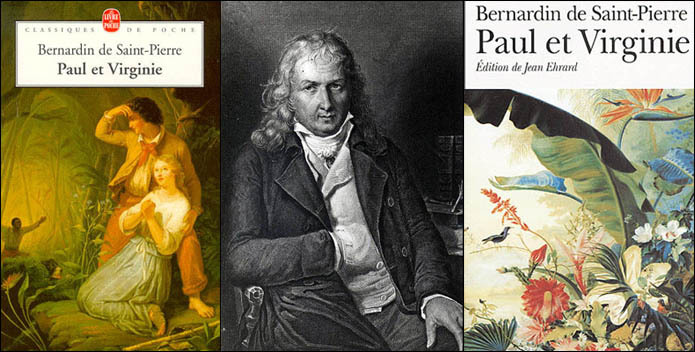 He took to fiction late (though there is a fair amount of it in his historical works), adopting a true-life incident for "Robinson Crusoe" (1719), his story of the experiences of a shipwrecked sailor which was calculated to appeal to a public fascinated by travel stories. It displayed Defoe's talent for organizing an effective narrative and his eye for telling and convincing detail. It was an enormous success (it still is) and he followed it with five more novels, the most famous of which today is Moll Flanders (1722), a picaresque novel of a female rogue. Defoe has little time for form and structure - his novels simply go on until they stop and are liberally sprinkled with inconsistencies - but Moll Flanders in particular is a novel of character, not just another 'romance'. 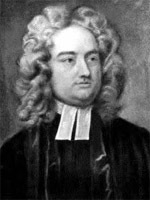 Jonathan Swift (1667-1745) was a gifted but complex person and a writer of incandescent talents, variously described as a poet, pamphleteer and satirist, who devoted much of his energy to propaganda for the Tory cause. From 1714 he was a virtual exile from the London literary scene as dean of St Patrick's in Dublin, his birthplace. His The Conduct of the Allies (1711), against the further prosecution of the War of the Spanish Succession, is often cited as the greatest work of its kind in English, but the book that established his immortality in literature is "Gulliver's Travels" , published anonymously in 1726. Gulliver makes four voyages of which the first two, to Lilliput, where the people are very small, and to Brobdingnag, where they are very large, are the best known. They are usually published in abbreviated versions that make them more suitable for children. For some critics, the last section, in the country ruled by the rational Houyhnhms, who arc horses, and their subjects, the bestial Yahoos (one of many Swiftian inventions that has entered the language), are more or less humans, is the best. When Gulliver finally returns home, he prefers to live in a stable, where the company is more congenial. "Gulliver's Travels" is, m the first place, a good story, which can be simply read as that and little more. However, it is also a seering political satire, guying contemporary politics and politicians, and, most powerfully, it is a savage indictment of human intolerance, meanness and small-mindedness, as relevant today as it was in the 18'th century. Swift was no novelist and "Gulliver's Travels" has little structural coherence or characterization. Nevertheless, it is one of the most popular, most often reprinted books ever written, and the main reason for its success is clearly its brilliantly imaginative narrative. 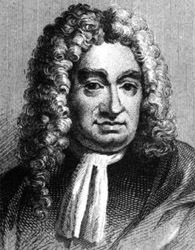 Swift was a friend of the essayists Joseph Addison (1672-1719) and Richard Steele (1672—1729), leading figures in the London literary scene who contributed to Tatler and founded The Spectator (1711). They had none of Swift's satirical violence, but wrote on a variety of subjects in beautifully simple and coherent prose, achieving a standard of journalism seldom equalled, let alone excelled, thereafter. The journal contained the work of a fictional group of gentlemen, the Spectator Club, representing various walks of life (the Army, trade, etc. ), in particular a country gentleman, Sir Roger de Coverley. Its amusing character sketches contributed to the development of the English novel. Although Defoe had no obvious successor, Samuel Richardson's Pamela (1740), generally regarded as the first true English novel, was in some ways a reaction against the kind of risque, incident-driven, narrative tradition that Defoe represented. Its heroine is a virtuous servant, who resists the advances of a young gentleman and gains the reward for her virtue in the form of marriage. A priggish tale perhaps, but Richardson knew the human heart, and had an instinctive understanding of the feelings of ordinary folk. "The History of Tom Jones, a foundling"
Samuel Richardson (1689-1761), known as 'Serious' as a boy, was a printer by trade, who discovered an aptitude for writing model letters for the illiterate, and when he turned late in life to novel writing (Pamela was followed by Clarissa, 1747, perhaps his best, and Sir Charles Grandison, 1753), he adopted the epistolary form. The limitations of that form and Richardson's image of rigid, middle-class respectability provoked the antagonism of Henry Fielding (1707—54), who mocked him in Pamela and set out to do so in Joseph Andrews (1742), until plot and characters took him over and his satirical purpose was largely forgotten. Richardson's reputation has undergone severe ups and downs. Immensely popular in his day, especially with female readers, he was denigrated in the 19th century, especially in comparison with Fielding, but has since risen again in critical esteem. Still, few people would read Clarissa rather than Tom Jones (1749), Fielding's masterpiece. Tom Jones is a foundling, brought up by the benevolent Allworthy along with his own nephew and heir, the devious Blifil, who is destined to marry Sophia, Squire Western's daughter, with whom Tom falls mutually in love. As a result of indiscretions with a gamekeeper's daughter, Tom leaves Allworthy's household and embarks on a series of adventures, which are enhanced by Fielding's brilliantly drawn minor characters. The construction of the novel is masterly - Fielding planned it with great care - and the story carries real suspense up to the highly satisfactory conclusion. Tom Jones is no Richardsonian hero, being impulsive and even foolish, but a generous, open-hearted soul. Sophia, the heroine, is a thoroughly convincing character, not a personification of feminine virtues. 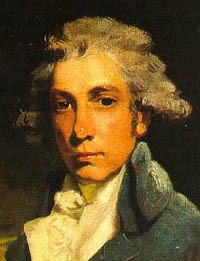 With Fielding's Tom Jones, the English novel came of age. Fielding, a gentleman by birth, wrote many plays and other works - skillful, inventive, often amusing. He was a man of large human sympathies who from 1748 was a highly committed magistrate in Westminster. His powerful, deeply felt opposition to social injustice and judicial corruption is manifest in a series of essays. of her fortune by way of marriage." Fielding, Tom Jones, bk. xi, ch, 4. 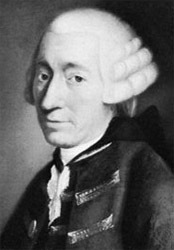 Tobias Smollett (1721-71), a Scot by birth, was a ship's surgeon, and made excellent use of his seafaring experience in his first and best-known novel, the picaresque Roderick Random (1748). His stories are violent and boisterous, and the comedy is sometimes spoilt by crudeness. But Smollett is still enjoyably readable, although he lacks the vision of Fielding and his major characters, especially his heroines, are hard to believe in. Of his later novels, perhaps the best is the last, Humphrey Clinker (1771), written in a modified epistolary form in which the same events are seen through the eyes of different characters. It contains some fierce, sometimes unconvincing satire on English fashionable society, but in general the humour is less coarse. Even by the standards of Church of England clergymen, Laurence Sterne (1713—68), a parish priest in Yorkshire, was very odd. An admirer of Rabelais and Cervantes, he wrote one great novel, "The Life and Opinions of Tristram Shandy, Gentleman", published in instalments from 1760. At first sight it is total anarchy. The hero is not even born until the third book, and the narrative is an apparently incoherent succession of episodes, conversations, strange digressions, bawdy humour, mini-lectures and sentiment, with unfinished sentences and even blank pages. All this, however, is by design, since Sterne wishes to convey that life and the human mind are not orderly. For all his sympathy with the miseries that human beings endure (Sterne's wife was a manic depressive), he sees them as essentially comic, even in appearance. 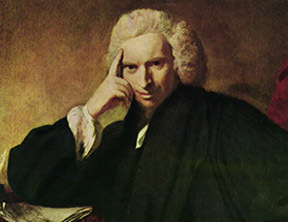 Sterne had some formidable opponents and Tristram Shandy, though it sold well, was not really appreciated until after his death. Richardson, Fielding, Smollett and Sterne are the giants of the first great period of the English novel, but they were not alone. Samuel Johnson's "Rasselas, Prince of Abyssinia" (1759) is largely a tract in the form of a novel, but Oliver Goldsmith's The Vicar of Wakefield (1766), another 'novel of sentiment', has proved to be of long-lasting popularity. The late 18th century produced two masterpieces in France. Les Liaisons Dangereuses by Pierre Choderlos de Laclos was published in 1782. The form was influenced by Richardson, but it is a very different kind of novel, a cynical treatise on the art of seduction. The second was "Paul and Virginia" (1787) by Jacques-Henri Bernardin de Saint-Pierre, friend of Rousseau. The story is of two children raised in a Rousseauesejue state of nature, brought to destruction by the dire influence of modern society.